Have you visited T2020 on Facebook? We all know that social media can be an important way to reach our friends, business associates, customers and stakeholders. For the last two years, Timmins 2020 has been on Facebook, offering news and updates on the things that are making Timmins a better place to live. We’re rounding the corner towards 2,500 “Likes,” almost all of whom actually live in Timmins. More important though, we’ve got a great engagement rate. Social media gurus say that a 3% engagement rate (that’s the number of people talking about your site divided by your total Likes) is excellent. We typically average 10%, which means we are providing content that people are interested in. If you haven’t “liked” us yet, please visit us, and be in the know about all the great projects happening in your community. It’s a great way to find out what people are saying – positive and negative- about life in Timmins, and a respectful, open forum to add your comments and ideas. 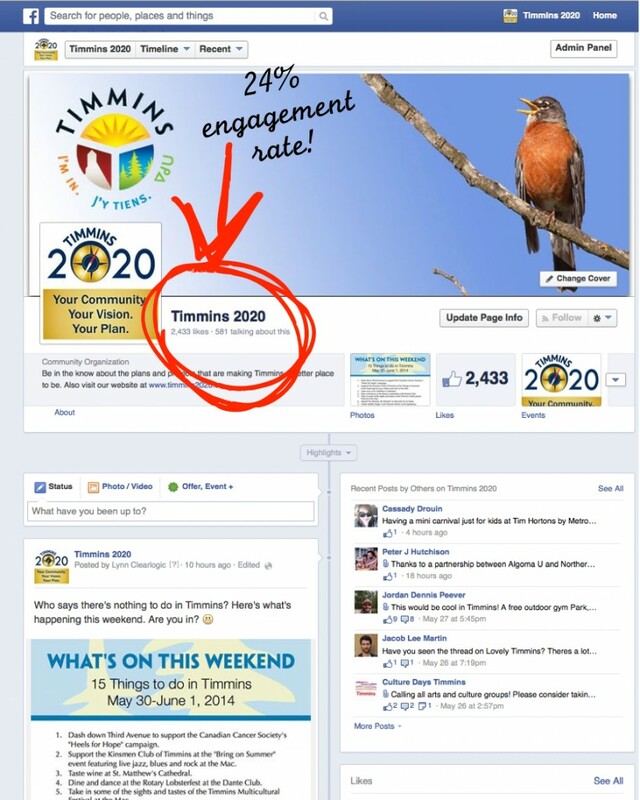 The Timmins 2020 Facebook page is part of the City of Timmins’ efforts to engage with more people and make sure that it has a channel to listen to its citizens on a regular basis. Join us!